When it comes to hosting friends and family, a no-sweat, prep-ahead approach to your menu lets you relax and enjoy the party, too! And no better way to do that than with a fun, gorgeous and grazeable snackboard! Pull out a colorful mix of small serving bowls to arrange around your largest platter. If you can, try styling your display with 1-2 colors (here we used cobalt blue) mixed with wood, white, and slate. Find a spot to group your board and serving bowls for the prettiest display, Placing everything together on a small tablecloth or group of placemats can help give cohesiveness. It wouldn’t be the Mediterranean without a fun mix of spreads and dips to enjoy! Pick up an assortment of your favorites such as hummus, babaghanoush, roasted pepper spread, tzatziki, pesto, or tapenade. You can also add small bowls of sweet drizzles such as honey, fig jam, or orange marmalade. Serve with warm toasted pita bread. A colorful mix of small bites adds substance and variety to your snack board and is easy to pick up at your local grocer. Visit the deli section for things like olives, roasted peppers, marinated artichokes or mushrooms, stuffed grape leaves, and pepperoncini. Fresh produce adds a colorful juicy, Mediterranean farmer’s market vibe to your display. Think grapes, cherry tomatoes, small cucumber slices, fresh figs, pepper strips, or sliced fennel. Depending on the size of your group you can also add cured meats, dried fruit, or nuts such as elegant Marcona almonds from Spain. 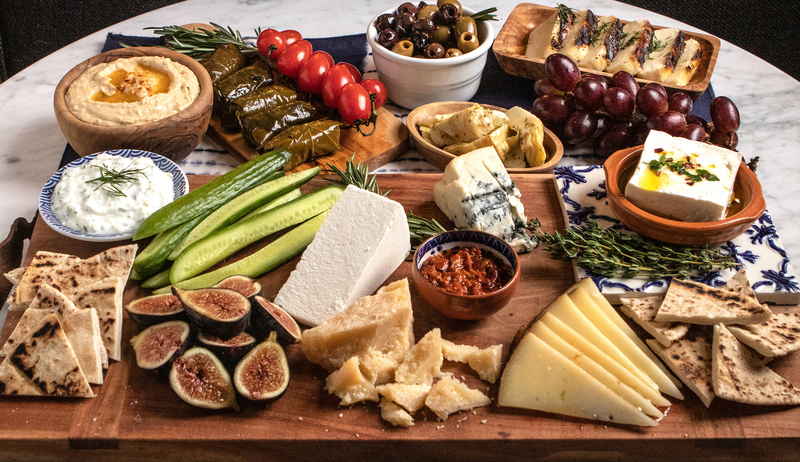 Arrange your cheeses, spreads, and nibbles around your display. Fill in any gaps with a mix of fresh herbs or triangles of toasted pita. Now it’s time to have some fun with gorgeous garnishes! Try some high quality olive oil over cheeses, olives, or other marinated nibbles. Sprinkle chopped fresh herbs or red pepper flakes on top to add color and a punch. Another favorite of mine is imported Spanish Manchego cheese drizzled with honey. If you somehow have any leftover you can use it to make our Spanish Serrano and Manchego Bites. Assemble your snackboard an hour before your party to bring the cheeses to room temperature so they taste their best, open some wine and your party prep work is done! Cheers!